As climate change brings more rain, Britain is suffering from the extinction here of our native flood engineers - the beaver. One reintroduction project in Scotland is showing this week why they are so important. The UK is drenched in flood waters again. With a changing climate meaning this will become a more and more frequent phenomenon, we're going to have to start to think more seriously about how to stop heavy rainfall from soaking people out of their homes and rotting fields of valuable crops. There used to be a creature in Britain which helped significantly with this effort. It was made extinct here around four centuries ago, but recent reintroductions of this rodent have shown the vital role they once had in reducing flooding – and how they could take up that mantle once more. In spite of their reputation for causing floods, beavers also have the capacity for mitigating the impact of flooding, but on a rather bigger scale. Here’s an example to illustrate the point. 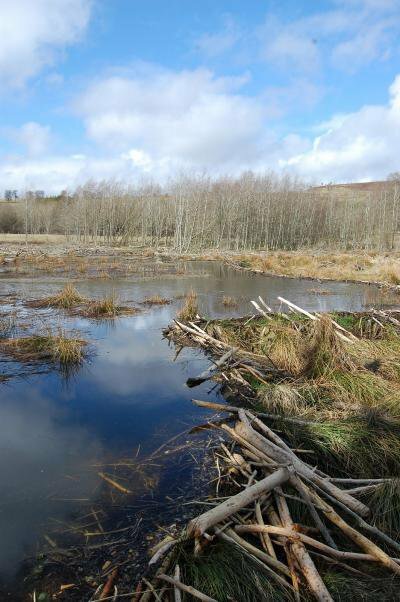 Some beavers were brought to a farm in the Tay catchment to live in large enclosures in 2002, as a demonstration project. Before there were beavers, across most of the flat land there was a five foot deep ditch running through. In dry times the ditch had very little water in it. In rainy times, and times of rapid snowmelt the water rushed down the ditch and tipped out into the burn that flowed down the little den and on to the neighbouring land. All that water headed quickly on its way through the agricultural land to the east, and on down the burn and into the Isla and then the Tay. In January 1993, when a fast thaw followed a big freeze, the Tay flooded its banks downstream at Perth and caused widespread damage to homes and great misery to many. Since then floodwalls have been built in Perth and there hasn’t been another flooding incident yet, but the water has come close to the top of the wall on a number of occasions. Other parts of low-ground Perthshire continue to suffer regular flooding. The beavers on the farm got established and started breeding by 2005. Over time they built, perhaps thirty dams and as a result they are holding up thousands of tonnes of water at the moment, as almost relentless rain has fallen in the last month. Just beyond the ditch there are two ponds that were dug in the 19th century for recreational use. By thirty years ago they were starting to dry out and one of them had become more of a wetland than a pond, and not a very wet wetland at that. The pond had shrunk and was heading the same way. The beavers, released into the pond, began by building up the barrage to increase the height of the water. Then when water started to overflow it they dammed the overflow in many places, creating a series of terraced pools. Looked at from a drought mitigation point of view there would be no question that the beavers have made the low-ground a wetter place than it used to be with plenty of water for livestock even in the driest summer. But it is clear to see that if this pattern were repeated in similar places all over the Tay catchment (or any river catchment) then in times of heavy rain or sudden snowmelt, the water rushing down from the highlands would be slowed up and absorbed more effectively by the large ponds, wetlands and streams with flights of beaver dams, than by deep cut ditches designed to channel water as fast as possible on to the next place. A flood, of course, is a pond in the wrong place. And beavers don’t always put their ponds in the right place. Sometimes they decide to put them in someone’s garden, or over a road. In cases like that they are not seen a flood mitigators, rather as flood creators. But the point is that, by creating multiple small floods, ponds, pools and wetlands upstream, they can help to mitigate bigger floods downstream. And small floods made by beavers in inconvenient places can be reduced or drained in various ways. Dams can be removed or modified. Whereas large floods cannot be so easily dealt with and may cause widespread problems. Along with floodwaters goes sediment, and this becomes a serious pollutant once it reaches the cities and the sea, clogging drains and damaging marine life. Beaver dams hold back sediment to a hugely significant extent, as shown by studies done in Texas and Belgium. (The two species, Eurasian and North American are shown to have much the same impact). With increasing climatic uncertainty it is going to be necessary to take some land in the former floodplains out of agricultural use and restore old oxbow lakes and wetlands to allow the absorption of floodwaters and sediment in times of spate. As George Monbiot is quite right to point out, how upstream land is managed has a vital role in determining whether or not there are floods downstream. The way to stop water from flooding houses (alongside not trashing the climate) is to stop it from running so quickly off the hills. For thousands of years, British beavers contributed enormously to this work. It's time that we allowed them to once more.